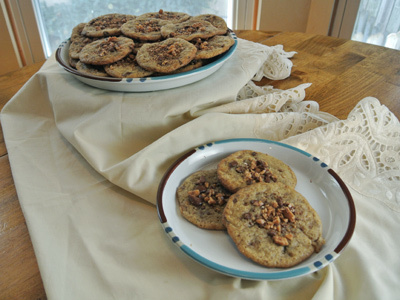 Recently we had some family over for a get together and I made a batch of heath bar cookies. Yes, I braved the hot oven but it wasn’t so bad, I started early and got done before the heat really set in. Cookies make people happy no matter what time of year even though it might be a challenge to bake during the hot summer month’s. 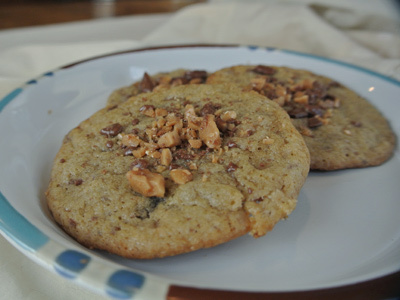 I added a few toffee pieces just as they came out of the oven which melted right into the cookie for an added bit of crunchy topping. 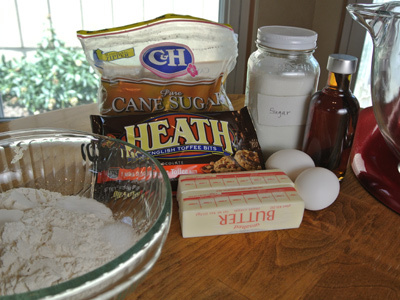 The ingredients are a mix of flour, salt and baking soda, plus some butter, sugar, brown sugar, eggs, vanilla and heath bar toffee bits. If you want to sprinkle toffee bits over the top you’ll need an extra cup of toffee bits. 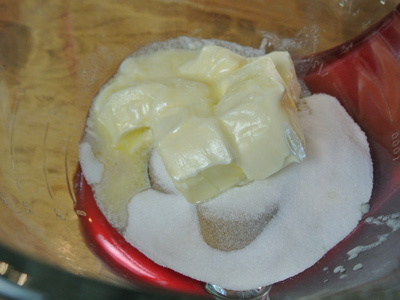 Add the softened butter and sugars together in a mixing bowl. 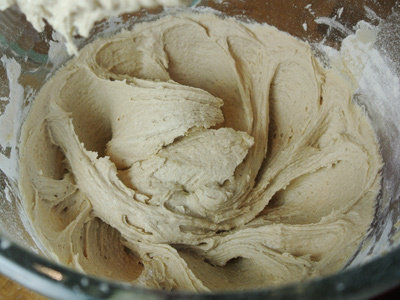 Beat on medium speed of a stand or hand mixer until the mixture creams together. 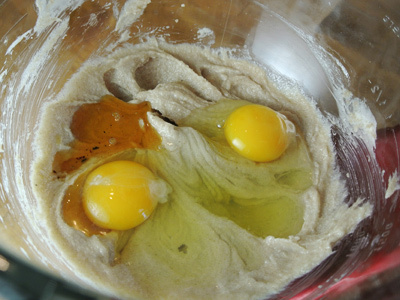 Begin adding the flour mixture (flour, baking soda and salt), a little at a time until it’s well blended. It becomes a nice thick cookie dough. Next blend in a bag of Heath Bar Toffee Bits. Set the cookie dough in the fridge to chill for 30 minutes to 1 hour. I used a small ice cream scoop to measure the dough balls. 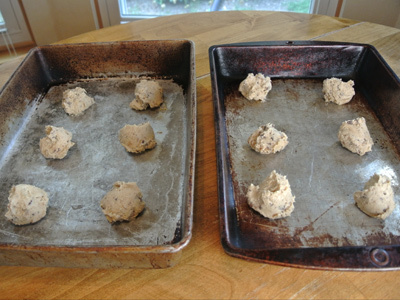 Place several inches apart on a cookie sheet or bake pans. These cookies tend to spread out as they bake. Set in a preheated 350 degree oven for 10 – 12 minutes. This is optional but makes for some extra crunch and toffee bliss. 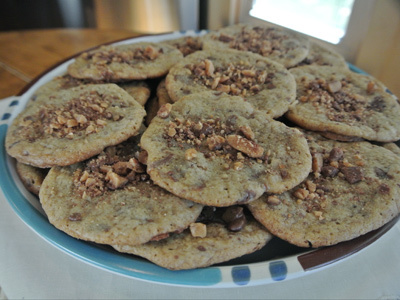 Add a sprinkle of toffee bits to the cookies just as they come out of the oven. The toffee bits will melt right into the hot cookies. 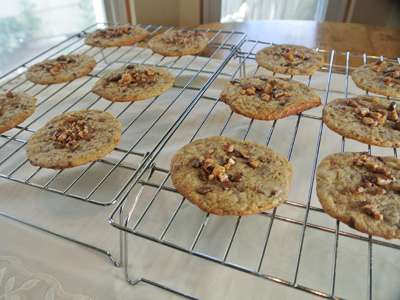 Set the cookies on a cooling rack while you get the next batch going. This size cookie made about 3 1/2 dozen. Combine flour, salt and baking soda in a medium bowl. Set aside. 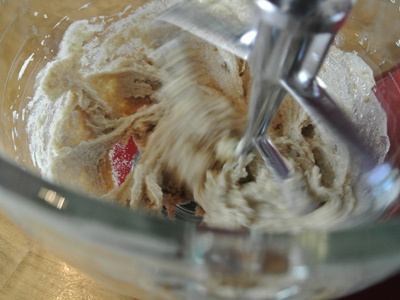 Using a stand or hand mixer, beat together the butter and sugars. Add the eggs and vanilla and mix well. 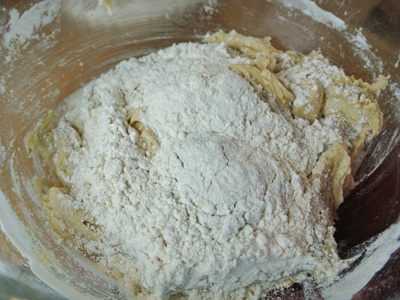 Begin adding the flour mixture a little at a time beating well after each addition. 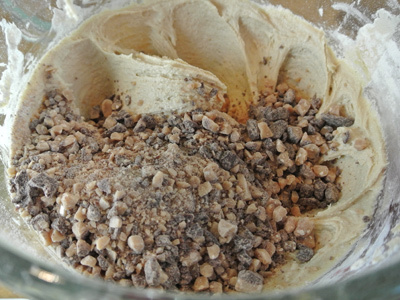 Add the package of toffee bits and mix well. Refrigerate the dough for 30 minutes to 1 hour. Preheat oven to 350 degrees. Using a small ice cream scoop, spoon cookie dough onto a baking sheet. Make sure to leave room between the cookie dough as the cookies will spread as they bake. Bake for 10 – 12 minutes. 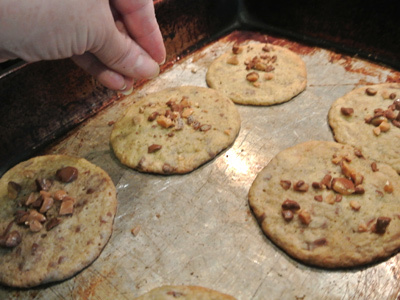 If desired, sprinkle a few toffee bits over each cookie when they come out of the oven. The toffee bits will melt into the warm cookies. Remove to a cooling rack. Oh my! I can eat this entire plate. The only thing missing is a tall glass of milk here to wash everything down. 🙂 Great post Jan! Thanks! Next time I’ll remember the milk!